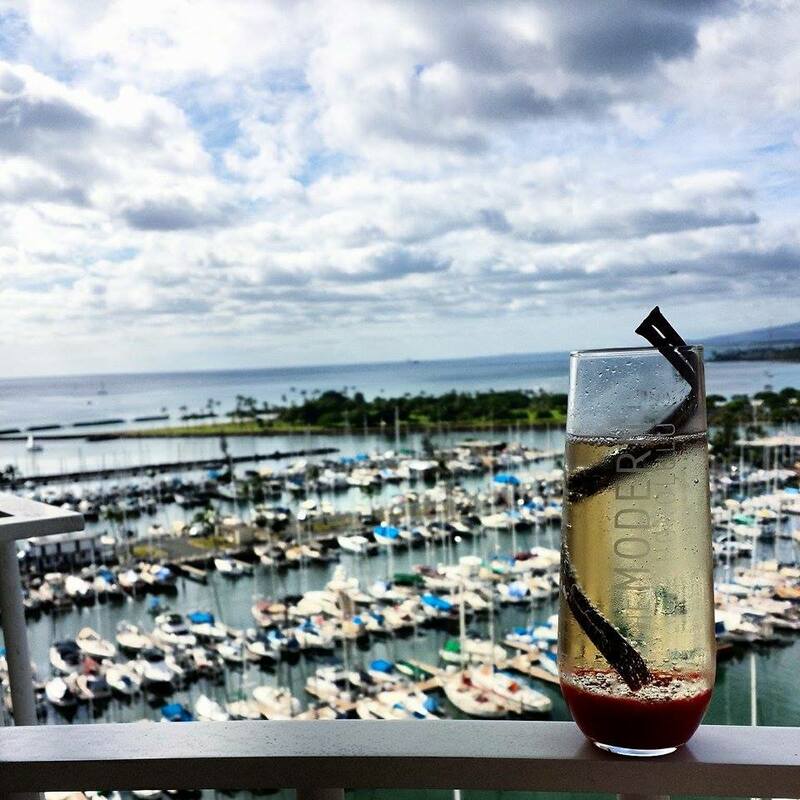 One lovely day, #bae planned a staycation for us, for somewhat G-rated reasons, at the Modern Honolulu—voted “Best Boutique Hotel” by Hawaii Magazine readers, and recipient of some AAA and TripAdvisor awards. The plan was to have a weekend of light poolside boozing in the sun, and retiring to our make-pretend-it’s-ours bedroom at the end of the day. Unluckily for us, it was a very overcast weekend for the entirety. We walked by the pool area one time to meet another couple before heading to Sarento’s for dinner the first evening. That was our poolside experience. 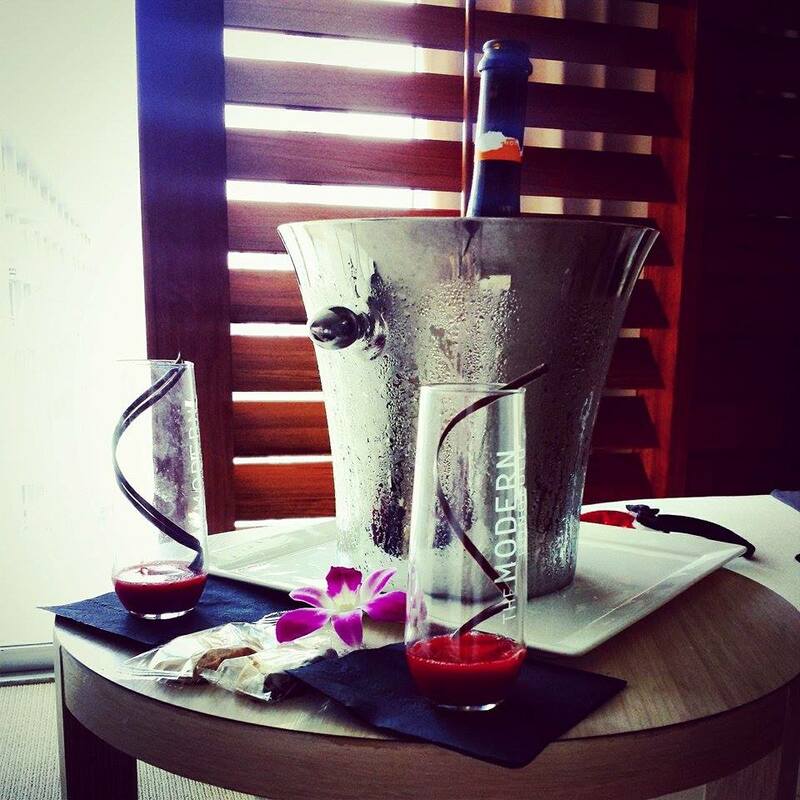 Luckily, the Modern Honolulu made up for it with some special VIP treatment, for which I give #bae full credit. Word to the wise, don’t try to mix that raspberry jelly into your drink. I must not be that classy because I didn’t know, but I’m fairly certain it’s inedible. Anyway this was exactly how our room looked. I failed to take a picture as we walked in, so I’m borrowing this, but this is essentially the one. I’m not gonna lie, I was a little unastounded by the immediate view of the Castle Ilikai Marina across the way. That is, until I stepped out with my glass of prosecco and saw what “partial ocean view” actually entailed. Yes, this will do. I am all about this life. Now, this, I can handle. 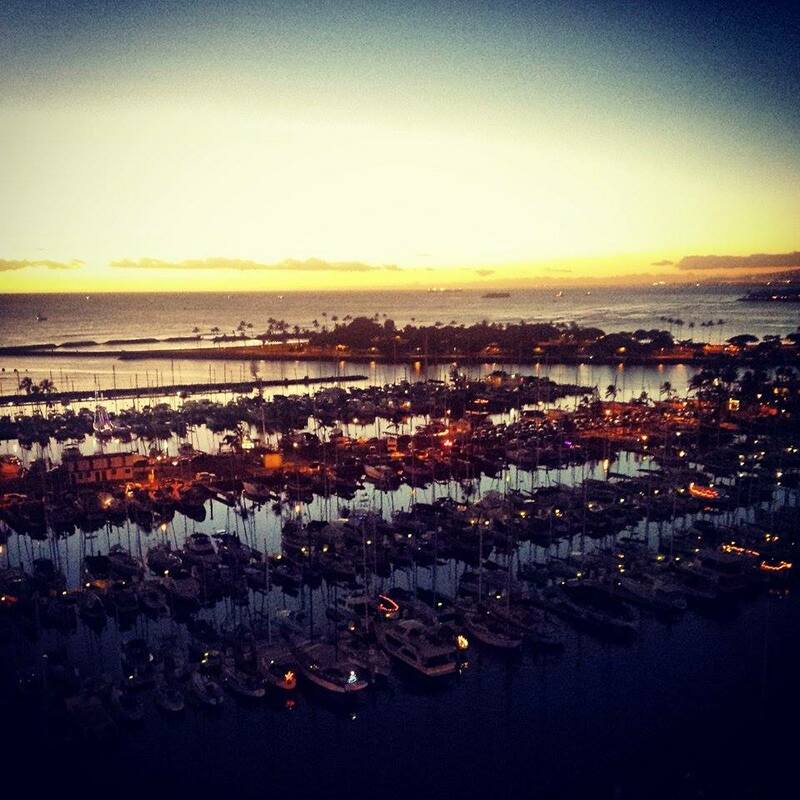 It doesn’t look that high up, but it was high enough that #bae had that look in his eye when he stepped out onto the lanai and looked over the edge just a bit. I suppose I exacerbated that a tad when I wiggled and pretended to lose my balance. What can I say? I have a great sense of humor. We had expected to be lounging by the pool while the sun set, but the view from our room was everything we wanted, minus the pricey bar drinks, and plus a second complimentary bottle of bubbly. Before I forget, what that picture of the bedroom doesn’t show you is the bathroom, whose partition between it and the bedroom was two sets of wooden shutters that, I sh*t you not, amplified the sound of bathroom activities. Major, major oversight of design, if you ask me. That is not one of the many ways through which I would like to bond with my man. Shame on you, Modern. Fortunately for them, it was the holiday season so I was ready to forgive—and committed to never using the restroom, ever. Merry Christmas to all. 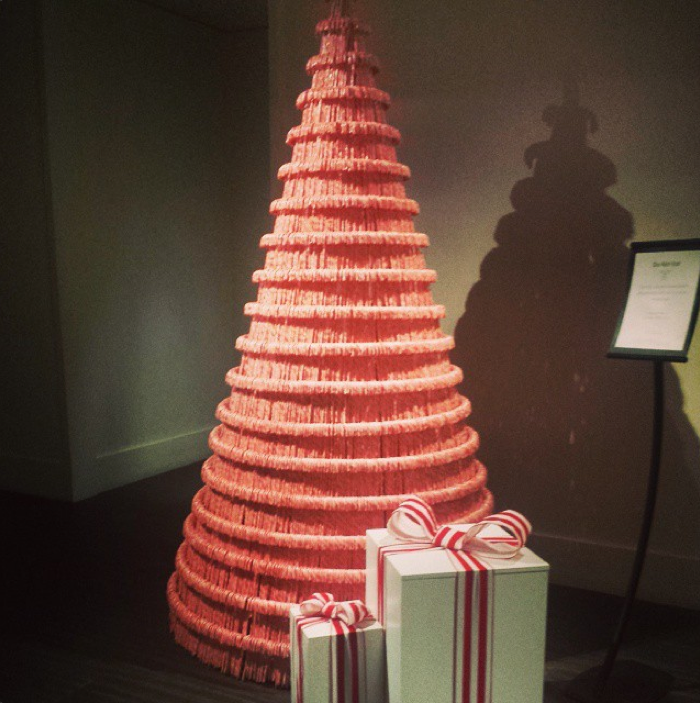 A Christmas tree made entirely of candy canes and effort. The most memorable aspect of this hotel was the bed. In all seriousness, that has to be the most comfortable bed in all the world. Is there a Most Comfortable Bed contest? Because the Modern Honolulu would win, hands down. I had to be talked out of taking the pillows with me, it’s that good. 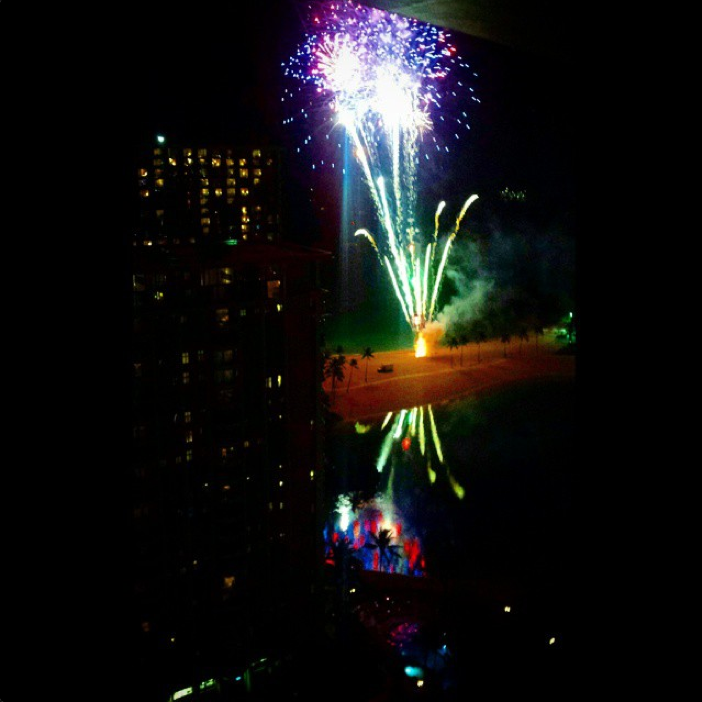 We dotted our stay with dinner at Sarento’s Top of the I for Friday night oceanfront fireworks. And went to Ruth’s Chris (my first time ever) the very next evening. 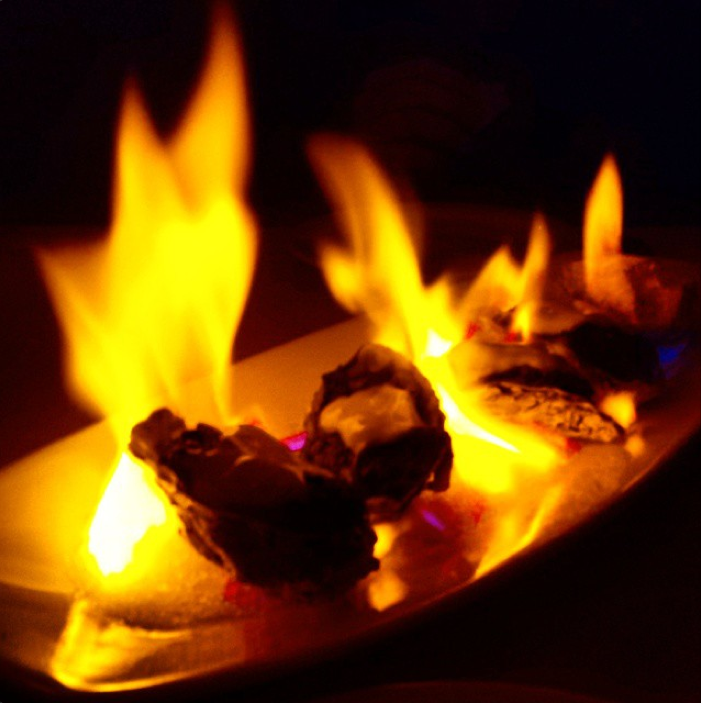 Apparently “Oysters Rockefeller,” instead of baked or broiled, can also be set aflame! They even reposted my Instagram picture! Beer was a poor choice, but after drinking all weekend, Ruth’s Chris was more than enough when I only needed food in my belly. Also, look out: when they say the macaroni and cheese is oh-so-good, they mean it has jalepeños. Thumbs down for me. We left that weekend well-rested and with two hands full of leftover food the hotel graciously refrigerated for us (only because I promised I wasn’t the type to sue them if it went bad in their care—I do not recommend trying this persuasion tactic). That must have been the prosecco talking.